The Social Group began 7 years before Facebook and 10 years before Twitter. It was started by Andrew Haglington in South West England. Spot the odd one out: Bill Gates, Andrew Haglington, and Mark Zuckerberg. Andrew’s fame and wealth don’t compete, respectively, with the founder of Microsoft or the man behind Facebook. But had things turned out a little differently when the Englishman was at the forefront of the social networking revolution he, not Zuckerberg, might have been the one this month sitting on a business worth £60 billion. Flashback to 1997 and Andrew, living in Devon, identified the need in society for a friendship / connecting mechanism and invented social networking. He sets up a basic website through which people meet just for fun using their own names – revolutionary compared with the forums of the time that mainly uses pseudonyms. They can leave messages for each other and add photos. He is years ahead of Facebook – the global giant did not accept members outside Harvard University, where it was founded, until 2006. It sounds an unlikely tale, but the British Library is convinced. “The British Library asked permission to save our http://www.devonsocialgroup.com website forever as one of important historical significance,” says Andrew. So what happened? Where did it all go wrong? Why isn’t Andrew worth billions? It seems the world, or South West England at least, wasn’t ready for the phenomenon. Although Andrew built what was then ‘Devon Social Group’ up to several hundred members, he had to spend as much time explaining the idea of meeting for fun in cyberspace – and getting together as a group in the real world – as he did running the organisation. Worse was to follow. After a couple of years Andrew decided it was too much trouble and had to take the website down. “Some people used it to argue and insult each other,” he says. “Other people didn’t like sharing pictures and being talked about.” Andrew, who has ME – myalgic encephalomyelitis – was so ill with the chronic fatigue disease at the time that he was unable to cope with lots of upset. He hardly had the energy to battle through each day, let alone get people to understand how to behave properly in an online forum. Andrew tried to get financial backing. But private and public investors in the UK didn’t understand ideas that were groundbreaking and so far ahead of their time. Andrew struggled on alone and watched the likes of MySpace in 2003 and then Facebook in the USA attract lots of corporate backing and investment, and grow into organisations with a global reach and life-changing concepts. Andrew may have missed out on a fortune, but there is a happy core to his story. He found something far more precious than money – love. Today Andrew runs what is now ‘The Social Group’ with his wife Cathy, the woman he met through the online organisation. The title reflects what is growing from the South West into a UK national business. 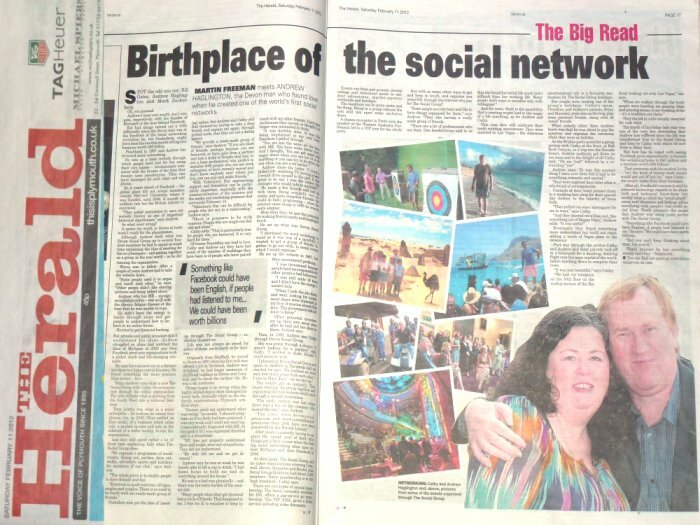 They jointly run what is an independent ‘social enterprise’ – Andrew reckons he coined that phrase too, in 2003. The couple settled on that model, of a business which takes only a modest income and acts in the interests of a wider society to run the organisation. And they still spend rather a lot of their time explaining fully what The Social Group does. “We organise a programme of social events, dining out, parties, days out, walks, adventure sports and holidays for members of our club,” says Andrew. Outsiders now get the idea of ‘meeting’ online and do understand what they mean by ‘social’ in this context, but Andrew and Cathy still find themselves having to take a deep breath and explain yet again, through gritted teeth, that they are not a dating agency. With Valentines Day approaching, support and friendship can be particularly important, especially with the commercialisation of the occasion and the media and marketing pressure that surrounds February 14. Of course friendship can lead to love. Cathy and Andrew say they have lost count of the number of weddings they have been to of people who have paired up through The Social Group – including themselves. Life was not always so sweet for either of them, particularly so for Andrew. Originally from Sheffield, he moved to Devon in 1991 when his first wife was offered a job in Tavistock. Andrew was delighted: he had happy memories of childhood holidays in Devon and Cornwall and he loved the outdoor life. He was a ski instructor. Things began to go wrong when the highly skilled Alpine skier damaged his lower back, ironically while on the distinctly unadventurous Plymouth artificial slope. “Doctors could not understand what was wrong,” he recalls. “I showed symptoms as if my body had been poisoned. I was very weak and I could not stand up. I was eventually diagnosed with ME. At the age of 33 I was registered disabled and in a wheelchair. “M.E. was not properly understood then and people were not sympathetic. They did not understand. He was in a bad way physically – and there was the extra burden of the emotional side. “Many people when they get divorced lose a circle of friends. That happened to me. I was too ill to socialise or keep in touch with my other friends. I lost them too because they moved or thought I was no longer interested in them. It was a horrible time. It was like being imprisoned in my own body. Somehow I pulled through. He eventually made a few friends and met up with them. Being originally very sociable, and quite computer-literate – he was self taught at basic programming back in the early 1980′s, enough to create his own games – when the internet came along in 1995 he was an early adopter. More than that he saw the potential for making friends easily and keeping in touch. He set up the website in 1997, but then encountered problems. “It wasn’t like it is today. People didn’t accept things as they do now, and here in the UK there isn’t the same right to freedom of speech that there is in America. I was threatened because people held me responsible for other people’s bad behaviour. Other potential investors, including some well known names, set up their own social sites and event companies after he had put his ideas to them, Andrew says. Then in 1999 Andrew met Cathy through Devon Social Group. The couple got on instantly. They began running the group together and organising the new website which went through a second incarnation. “The early version of this was lost when there was a fire at the company who hosted the site,” says Andrew. After years constantly having to explain the ‘social’ part of their title, things got a little easier when the first big social networking sites came on, first MySpace, then Facebook in 2006, and then Twitter in 2007. As with all service-based organisations, The Social Group has been affected by the challenging economic climate of the last few years. At their peak, The Social Group and its sister organisations covering Cornwall, Devon, Somerset, and Bristol, plus Social Group Holidays had over 1,000 active members. Today membership is in the ‘high hundreds’, Cathy says, and the couple are determined to see out the recession and continue to offer their social networking services to as many people as possible. There are two types of annual membership. The basic, currently available for £65, offers a pay-as-you go membership. The VIP, £165 gives a fuller service including some discounts. Events run from pub quizzes, cinema outings, and restaurant meals, to outdoor adventures, murder-mystery weekends, and holidays. The vacations can be quite exotic and far-flung. Being in a group reduces the cost and can open some exclusive doors. In America, the group have met A list celebrities such as actor Owen Wilson and indie band The Red Hot Chilli Peppers, with Andrew himself spending time with singer Peter Andre and meeting Hollywood legend Elizabeth Taylor. A chance encounter in Exmouth, Australia, with Fred Reibling, the speaker of the Western Australia Parliament in Perth, led to a free VIP behind the scenes tour for the whole party. Andrew may not be worth billions, but he has led an extraordinary life, with him appearing to have a knack of ending up in the middle of some amazing things. But with so many other ways to get and keep in touch these days, and organise your social life through the internet, why pay for The Social Group? And for some there is the possibility that a meeting might lead to the magic of a life matching, as for Andrew & Cathy. Just returned from leading a Caribbean Cruise as international tour guides, this year the social media celebrity couple will celebrate their 10th wedding anniversary. They were married in Las Vegas – with the American entertainment city being a favourite destination for Social Group Holidays. At the time, the couple were leading one of the group’s holidays. Cathy’s mum, Christine, and Andrew’s parents, Brian and Maureen, were also on the trip, plus some personal friends, along with 28 ‘social’ friends. What nobody other than Andrew knew was that he was about to pop the question and organise the ceremony while they were on holiday. As the 30-plus party posed for a group picture with Cathy at the front, at Red Rock Canyon, on a trip into the Nevada desert, Andrew suddenly got down on one knee and to the delight of all Cathy said “Oh my God!” followed by a resounding “yes!”. They were married days later, after a whirlwind of arrangements. Contacts at their hotel pointed them to a wedding hire shop for their special day clothes, to the hilarity of them both. “They pulled out some ‘meringues’ for me to wear,” says Cathy. Eventually they found something more understated, but could not resist adding a touch of Vegas glam to the ceremony. Part way through the service Cathy and Andrew and their parents took off in a helicopter for a dazzling, dizzying flight over the neon capital of the world before touching down to complete their vows. “It was just beautiful,” says Cathy. “We had our reception on the 50th floor on the rooftop terrace of the Rio Hotel looking out over Las Vegas,” she says. They stayed in a suite at the Hard Rock Hotel usually reserved for rock stars. The death of his father last year was one of the very few downtimes that Andrew has suffered since his life was transformed first by The Social Group and then by Cathy, with whom he now lives in Mary Tavy on Dartmoor. But how has Andrew coped with seeing Facebook grow exponentially to become the socialising home to 845 million and a business worth £60 billion? That contrasts with the modest living – “not the kind of money most people would get out of bed for,” says Cathy – the couple make from their business. After all, Facebook’s success is said by internet technology experts to be about luck and technical know-how, but mostly what is called the “social graph”: using real identities and linking online socialising with people’s real-world social lives. That’s precisely the model that Andrew was using years earlier with The Social Group. That’s because Andrew has found something money can’t buy – happiness. I would hope local people are proud of us and all we have acheived, starting something so momentus, while helping so many local people to make more of their lives, and raising funds for charities and good causes along the way. It is flattering to be called a ‘social media celebrity’. I think I’ve always been a catalyst who has a tendency to make things happen around me. It’s just a shame that British investors / entrepreneurs seem to prefer to steal / copy ideas, rather than invest in talent. I really don’t think we have the required culture of enterprise in this country that there is in America. I think so much more could be done to create jobs and wealth here, but the system isn’t set up that way and so many people who you expect ought to want to help you just don’t. When you do come up with a great new idea, so many people try to stop you, ignoring you, telling you it can’t be done, or simply not ‘getting it’. What a pity those people didn’t embrace my ideas and chose not to back me! Many thanks to the local press in Devon for the recognition this week, and for all the support over the years. We have had lots of good support from the newspapers in Plymouth, Torquay, Exeter, and Barnstaple, and I would just like to say a BIG THANK YOU to all of them. As a footnote, it’s amusing that people think my role in this is all done with. That’s certainly not the way I see things. What’s happened since I started all this in 1997 is only the beginning of how far this is going to go, and here at THE SOCIAL GROUP, we have some big plans for the next couple of years – which certainly include keeping us at the heart of what we started! So … watch this space … and try to keep up!